Adding a room? Hot Spots in your Home? Looking to heat and cool your garage, workspace or server room? Call today to learn how a Ductless Mini Split can provide an energy efficient solution to your problem! Ductless Mini Split systems are relatively new to the United States however they have been used for many years in Europe and Asia. The name describes them accurately. They heat and cool your home or office without ducting. A wide variety of indoor units or fan coils can be mounted on the wall or in the Ceiling while a small outdoor unit is located on the ground or roof nearby. 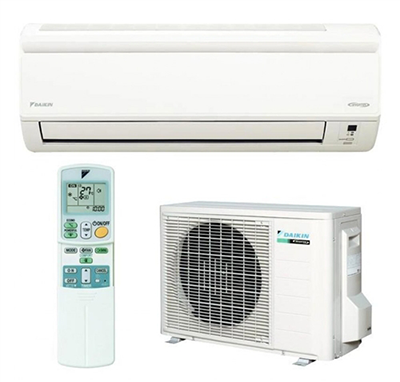 These units are generally Heat Pumps, but can be offered in Cooling only models. These are great for home offices, home studios, garage conversions, server rooms or home additions that cannot be covered by the existing system. McClelland Air Conditioning is proud to have over 15 employees on staff that have attended a two day Daikin University course on install, start up and commissioning of Daikin Ductless Products. We invest in our employees to ensure your install is to the highest standards. Visit Daikin AC to learn why we chose to offer Daikin Ductless Equipment, a global leader in Ductless HVAC Products.